Highlighters. Totally my shizz. Remember when Anastasia came out with their first highlighters last year? I was all over Starlight and Riviera and Starlight is still one of the most beautiful highlights for pale skin that I own. Then recently they launched the 4 pan palettes-initially two launched and there is a third on the way. The palettes are massive with 4 blusher size pans of highlighter. Each one can be depotted really easily which is great because although made of cardboard, the palettes are quite large (but really sturdy) and they don't really fit anywhere into my make up storage. What's great about the palette is that it's so versatile-used dry they're rather subtle, used damp with a sponge you can amp them up to 'I can see you from Space' proportions. Each highlighter can be used on it's own on cheekbones, collarbones, on the eyes or to highlight the nose or brow bone. Or you can get creative and make a bespoke highlight by combining shades together. 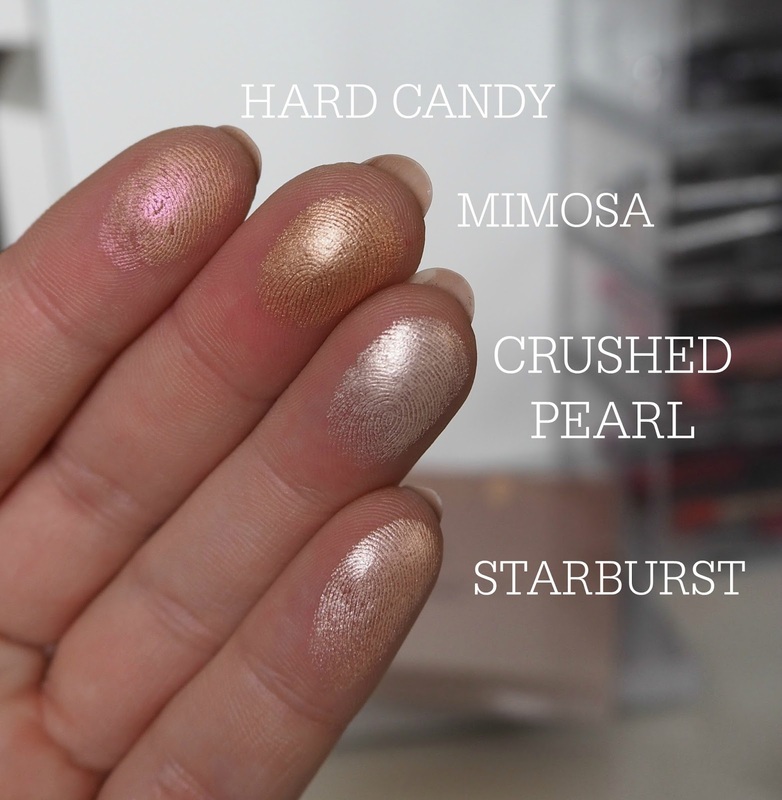 I've included swatches of the highlighters on my skin below-each used dry and taken in natural light. My skintone is MAC NW15/NARS Mont Blanc/Estee Lauder Ecru and I don't edit my photos at all to be as genuine/authentic as I can. Mimosa is a warm, champagne-y sheen that I tend to use with coral or orange toned blushers, placing it right at the top of my cheekbone where the blush ends-it's not too frosty and doesn't highlight pores. It's the most golden in the swatches but it does pull quite subtle on the skin if used with a small brush and a light hand. It does look slightly metallic when swatched heavily but it doesn't translate to the skin. Crushed Pearl is beautiful. It's subtle enough for day time or the one you can layer on your cheekbones until you reach Tin Man-esque status. I really really like it and it's perfect for pale skin tones. I also use this a lot to highlight under my brow. This is the palest of the four and the undertone runs white making it good for my skintone and probably the most versatile in the pan. Starburst is the one. There is no way looking at it in the pan I would believe this seemingly pink toned highlight could be so so so stunning but it is absolutely my favourite highlight of the moment-and I own a lot of highlight! 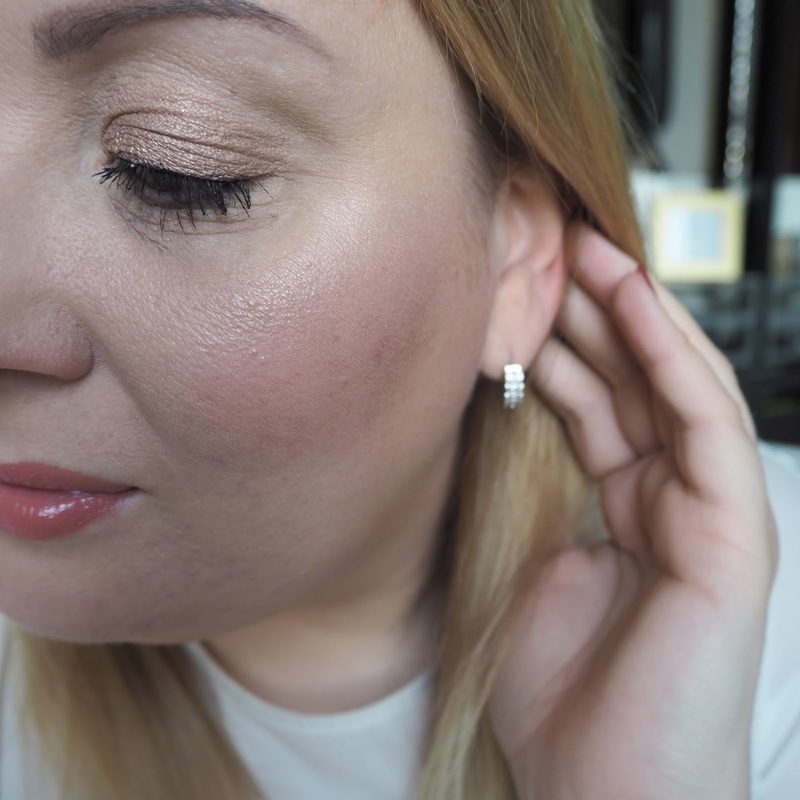 This highlight is so pretty on pale skin, it's the perfect 'white light' undertone, no glitter or chalkiness and a 'lit from within' ethereal radiance. On pale skin this is bomb. Being able to use three of the four shades on a daily basis has really impressed me in this palette-I bought it because I wanted it (new product launch lust should be a medical condition) but it's actually very versatile and wearable and something I'll reach for often. Are highlighters your thing too?